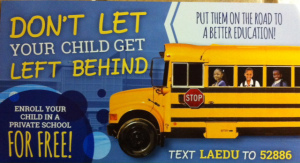 For the past few years, I have been receiving mailers from Washington, DC-based, Alliance for School Choice (AFSC). Alliance for School Choice is a nonprofit that promotes a particular kind of choice: publicly-funded vouchers to private schools. According to AFSC’s 2014 tax form (the most recent on file as of this writing), Michigan billionaire and voucher lover, Betsy DeVos, is AFSC chair. Also noted on the AFSC tax form is that DeVos’ American Federation for Children (AFC) is the lobbying nonprofit associated with AFSC.